While we’re waiting for Spring to kick in and the chance to start planting our balconies, windowsills and gardens, we are getting ready to do a bit of planting inside. In a week and a half, on March 23rd, SemiDomesticated will host a Terrarium workshop, and we’re getting excited! These miniature ecosystems offer endless opportunities and we’ve collected some of them below. 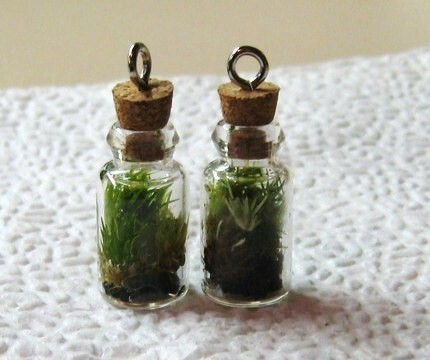 Terrariums can be made in all shapes and sizes, from these tiny glass pendant necklaces to mini bottles and inside glass light bulbs to large glass enclosures like water mugs, aquarium bowls, or whatever you can find. For our workshop, we are asking every attendant to bring the glass enclosure(s) of choice — so, it’s time to hit the flea markets and pick up the perfect one! Above (clockwise from top left): Pendant necklace Terrariums, Set of three terrariums in asymmetrical bowls, Terrariums with wooden bottoms, Large oval terrarium with ferns. If you’re not the nostalgic type and mason jars don’t appeal to you, the geometric versions below make for wonderful sculptural terrariums. The combination of the walnut and glass bottle with simple green ferns is absolutely divine! If you don’t have a lot of table space, make a hanging terrarium. Or do it just because it looks amazing! You can add humor to your terrarium with miniature figures, animals, buildings, cars or what have you. Or how about recreating a set from your favorite movie, like the Beetlejuice terrarium at the bottom right? Or how about adding natural elements like skulls, found animal skeletons or fossils? An old knick-knack from the flea market, like the gramophone below would also do the trick — or some gold painted porcelain mushrooms to brighten things up? 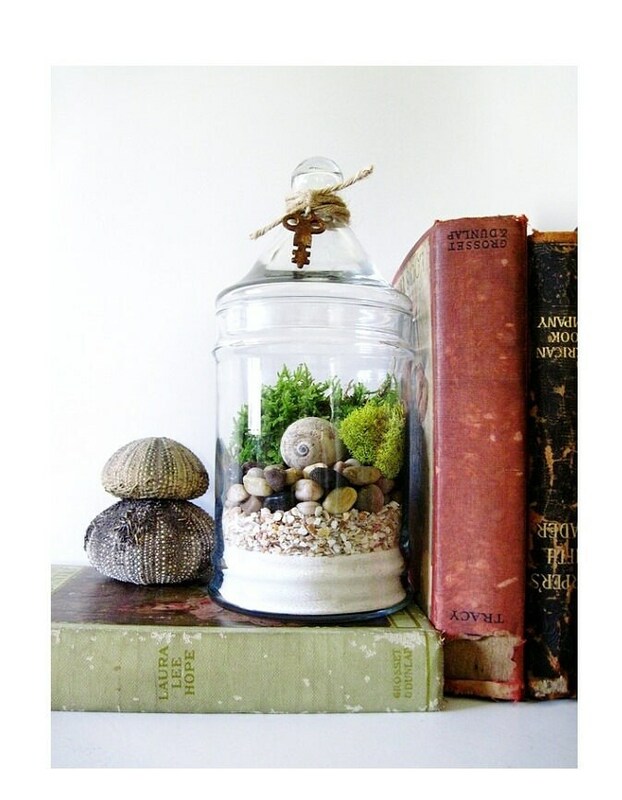 Integrate your Terrarium into your decor by making it part of a still life, surround the glass container with elements that repeat and pick up what’s on the inside, or use the whole container as a book-end. Feeling inspired? If you want to make your own terrarium and learn everything about how they work and how to best take care of them, you should come to our Terrarium Workshop at The Parlor on Saturday March 23rd. We will give you all the practical details and open up for sign up tomorrow. And be quick, there’s only 10 seats!